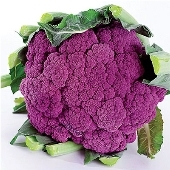 Distinctive and elegant, in the way only purple cauliflower can be. Easy-to-grow vigorous plants produce large purple heads which turn bright green when cooked. Cauliflower was developed as a food crop by the Italians and passed on to the French in the 16th century. Try it roasted with crispy edges to discover a taste that is far from bland. Eat cauliflower sautéed, steamed, boiled, pickled in chow-chow or mashed with blue cheese. It freezes well if cut into florets, blanched in boiling water for a couple of minutes, then cooled quickly. Nutrients: High in calcium and dietary fiber, folate, vitamin C.